Are you planning a Banff vacation? Look no further we have the best Banff vacations ideas and all the best things to to do in Banff! The Canadian Rockies lie between British Columbia and Alberta and a large area of the Rockies is made up of national parks – Banff National Park, Jasper National Park, Yoho National Park, Kootenay National Park which together make up the Canadian Rocky Mountain Parks UNESCO World Heritage Site and the Mount Robson Provincial Park. We had a great holiday here with our kids! The area gained the prestigious UNESCO status due to the unique landscape and natural beauty of the lakes, rivers, mountains, glaciers, canyons and limestone caves. Visitors come to the Canadian Rockies to experience the stunning natural surroundings, partake of outdoor activities and to explore the area's pioneer heritage. Once you start planning your Banff vacations you'll be wondering where to start! Visitors usually arrive at one of the larger towns by car or train, travelling by car lets you see a lot of the scenery and reach remote areas that you otherwise would miss out on. Banff, located along the Trans-Canada Highway, is perhaps the most developed town in the area. Here you can enjoy the hot springs, hike, bike and in winter go skiing. Nearby are several peaks including Mount Rundle, Cascade Mountain, Sulphur Mountain and Mount Norquay where there are outdoor activities. Banff has several historic buildings and attractions like the LUX Theatre and the Buffalo Nations Museum. Canmore (a 15-minute drive from Banff) is another popular stop, located just 81km from Calgary in the Bow Valley. The Canmore Nordic Center has cross-country ski tracks, trail running, and mountain bike activities. There are world-class golf courses; a farmer's Markets; the Rat's Nest Cave at the Canmore Caverns in the Canmore area. Don't miss out on a visit to the Banff Gondola where you can see the spectacular views of the scenery or take a boat tour to see Banff's wildlife and scenery. The landscape will knock your socks off! After having travelled the world I have to say the Canadian Rockies are simply spectacular. Don't miss all the surrounding towns on your Banff vacation either, it's easy to drive between Banff, Lake Lousie and Jasper! Rent a canoe on your Banff vacation and explore the lakes and enjoy the calm and breathtaking scenery! This is really one of the best things to do- my kids just loved it and it is so peaceful! Don't worry if you have never been in a canoe before those people at Banff's Blue Canoe will show you what to do! Jasper in Jasper National Park began as a fur trading post and important point along the trade routes. Tourists begin their time in Jasper at the Jasper Visitor Center and the Jasper-Yellowhead Museum. 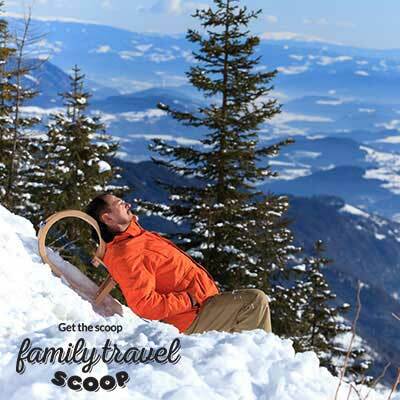 Enjoy the Mountain Wellness Spa, horse riding or the tramway! Several lakes in the area like Pyramid Lake, Medicine Lake and Maligne Lake add to the attraction of this town.Don't miss the Family Explorer cruise. Lake Louise, 3 hours from Jasper, is considered one of the most beautiful lakes in the world, it is surrounded by mountains and has a diverse number of recreational activities both on the shore and the water. Try the Gondola there for exceptional views, we even spotted a family of Grisly Bears! 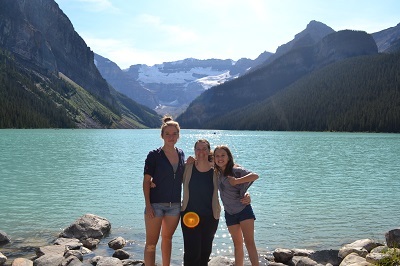 Visitors come to the Canadian Rockies to camp, stay in a motel, hotel or stay in one of the many vacation resorts, then they set out into the breathtaking and pristine countryside to explore. The area has a number of stunning waterfalls including the cascading Athabasca Falls, Bow Glacier Falls which has a 120 meters drop and the Chaudiere Falls which are 24 meters wide and situated on a stream between Caldron and Peyto Lakes. 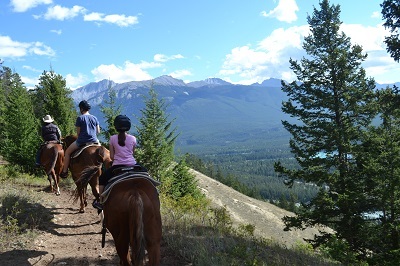 You can horseback ride in several places like Lake Louise; in Banff Park go sleigh riding or dogsledding in the winter and you can go rafting on the Athabasca River, Sunwapta River or Fraser River near Jasper. If you come to the Canadian Rockies in the winter to ski you can find ski resorts at Marmot, Banff, Norquay, Louise, Nakiska, Sunridge and Kinosoo. 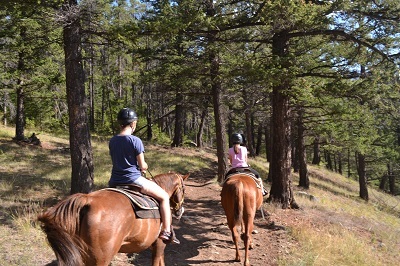 We went horseback riding at Jasper Horse Stables and it was amazing! Being in nature with the scenery below! Our kids still remember this as one of the best things to do in Jasper! Read more here! There are active glaciers and ice fields in the Rockies, the best known being the Columbia ice field which is the largest in North America (325m²) located between Jasper Park and Banff Park. The waters from the ice field feed the North Saskatchewan River, Athabasca River and the Columbia River. The Burgess Shale is an important fossil area located in the Canadian Rocky Mountain Parks. 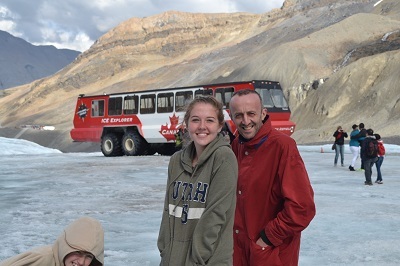 We really loved going out on the glacier and the kids were fascinated by the fact we were in such a cold place in the middle of summer! A very cool Rocky Mountain experience! Read more here! Lake Louise offers more stunning scenery! From the famous Chateau Lake Louise to the Lake Louise Gondola you will not be bored here! We enjoyed hiking up the trails at the Fairmont until reaching a quaint tea house! It is quite a trek so best for older kids and teenagers but the reward is worth it! That being said we did see a couple with a baby in a carrier making the hike but I think it is too slippery to risk it myself! The Gondola here is amazing! We saw a family of grizzly bears at the top which was a great experience the kids still talk about today! There is an educational center at the top where you can get a drink and enjoy the views while learning about wildlife in the area. As the bears came out we had to wait until they retreated a bit before we were aloowed back down! While in the Canadian Rockies you are sure to come across some of the wildlife like the Rocky mountain goat, bighorn sheep, hoary marmot, northern pika, moose, caribou, deer or even Grizzly bears. The skies above the Rockies are also full with beautiful creatures like the grey jay, mountain bluebird, golden eagle and the rock pipit. Visit the Tourist Board to plan your Banff Vacations.